I've been meaning to make blueberry wine for quite a while now. 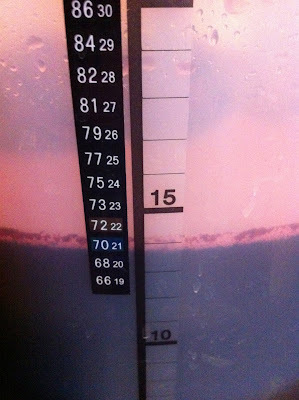 I have done a few grape concentrate wine kits but wanted to take it to the next level and make wine from scratch. Using blueberries as my fruit seemed like a logical choice given the abundance of them each Fall in Newfoundland. I wanted to get a good understanding of the process so I bought The Joy Of Home Winemaking which goes into great detail about how to make fruit wines or just about any other kind of non-grape wine. 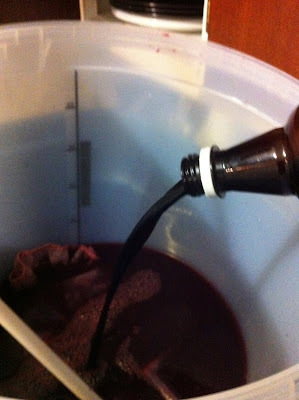 I also picked up the scratch wine kit from my local homebrew store, which includes a blueberry wine recipe of their own. Using the recipe from the book and the store, I came up with my process, which seems to be working so far! This will make about 11.5 L or 3 gallons with about 8% alcohol. I wanted to make sure it tasted like the berries so I thought a 2:1 ratio of berries to honey made sense. 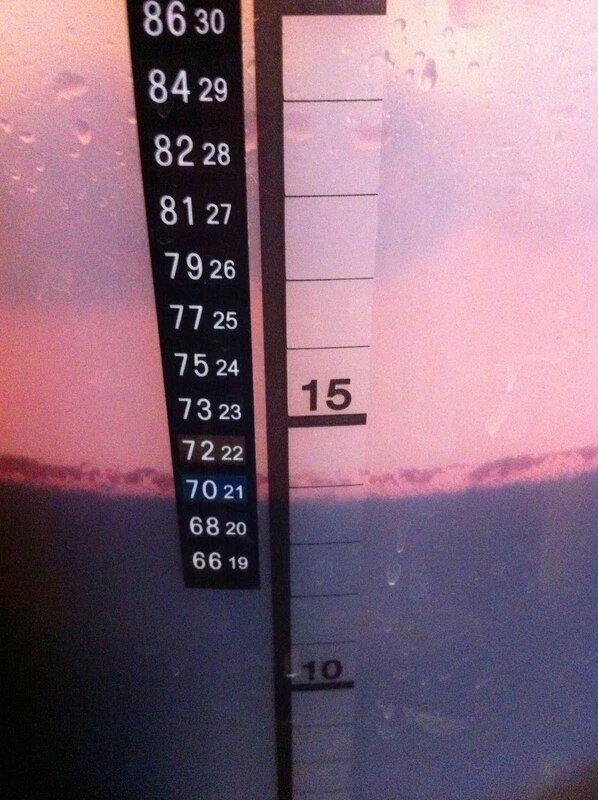 I could have made 1 gallon of stronger wine but I wanted to be able to give people bottles so I went for quantity over strength. Also, since I'm using honey, this is technically melomel and not wine, but I'm just going to call it wine for simplicity. Laura and I picked an ice cream bucket of berries in the Fall and that took a couple of hours! I probably only picked a third of that so she was twice as fast as me. I knew I needed more berries but didn't want to pick them myself. Fortunately, a co-worker gave me another large bundle and I will be happy to give him some wine when it's done. Anyway, let's get on to the making of the wine. 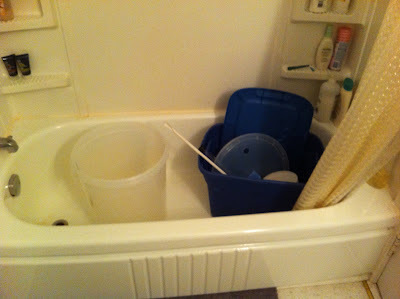 Since we don't have much counter space or a large basin sink, I clean and sterilize all my gear in the bathtub so that's pretty sweet. The berries were frozen and since I wasn't thinking ahead, I had to thaw them out on low on the stove and with a couple of liters of water. Once the berries were thawed out, I crushed them using a potato masher. You should wear dark clothes when you do this and keep away from walls and try not to splatter. Just for future reference. Anyway, I was sure to relax, not worry and poured a homebrew, just like my favorite book suggests. With Laura's help I transferred the crushed berries to a nylon sack in my primary fermenter (bucket). This will keep the pulp out of the final product and make the berries easy to remove when the time comes in a couple of weeks. 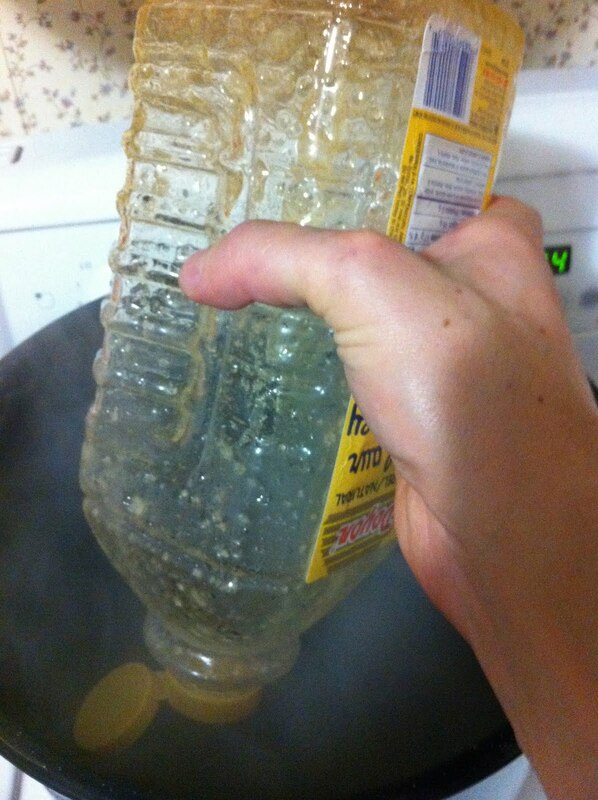 I put 6 liters of water in another pot to boil the honey. Looking back, for that amount of honey I could have used half that amount of water but now I know for next time. This just meant that I was cooling down a larger volume of water where I could have just added cold water once everything was mixed together. For reference the SG of this mix was 1.096. Once it was boiling, I skimmed off the brown foam that collected on the top. I boiled for about half an hour and then put the pot in some cold water to cool it down to room temperature. To cool it down as fast as possible, I made a circulating system using some tubing and my auto-siphon. I got this idea from a free Booz How Tooz iPhone video tutorial. I dissolved the bentonite, acid blend and crushed Campden tablets into a couple of liters of warm water and poured that over the berries, along with the grape concentrate. You can see the sack floating in the bucket here too. 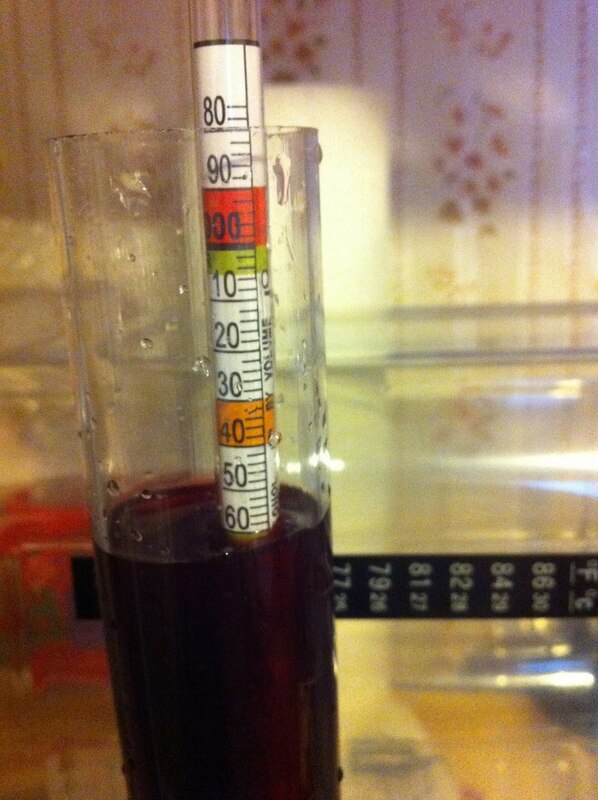 For reference, the SG of this mix was 1.041. Then I added the cooled honey water to the bucket. This total volume was 13.5 L with an SG of 1.064 at a temperature of 26C. The volume of the sack of berries is around 2 L so that will give me the 11.5 L final volume I need. 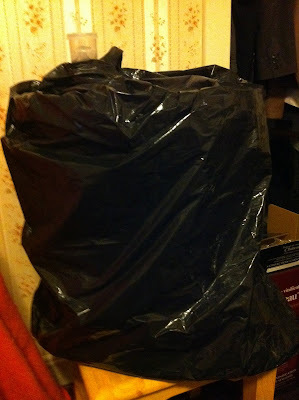 I took the bucket upstairs and covered in in a garbage bag to keep the light out and catch any spills. I have a space heater in the room to maintain a temperature of 20C. It took this donkey four and a half hours from the time I started cleaning my equipment until I was done cleaning up. A normal person could probably do it all in 3 but that's just how I roll. You can't add the yeast until the fruit is broken down more and in order to break it down you use the pectic enzyme. One set of instructions said to add the enzyme 12 hrs after the Campden tables so I waited till the next morning. 24 hours after that, I added the yeast. I put the yeast in some warm water to activate it before adding. I checked the must (mix of water, sugars and yeast) the next day and there was some activity. Not as much as beer, but I was happy to see that something was happening. You have to stir the must every day until you remove the berries. Otherwise, I guess the pulp gets rotten on the surface. I keep the spoon in there so I don't have to wash and sterilize it every day. I will take another SG reading after a week. I'm going to leave the sack in there for a couple of weeks. Then I'll leave the must in the primary for another week and then rack over to the carboy until the the fermentation is done. Check out the full photo album here. I am making blueberry wine as well. I grow my own blueberries. Trying different recipes. How did yours turn out? Also, I wish to be organic and so do not want to add the campden tablets, or any other thing for that matter. Used only berry, water, sugar/honey, and yeast. Cooked the juice to kill off germs/natural yeast. Do you think that is good enough? Seems to be going well. 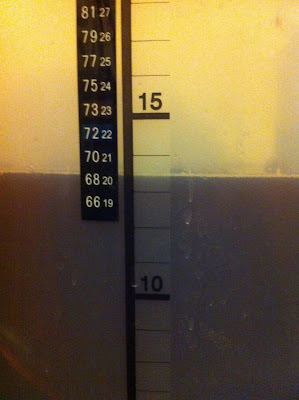 Passed primary fermentation. Racked twice. Still dark. Tastes good at room temperature... so far. No gadgets I use/have. Judge by taste alone. Sorry for the delayed response. 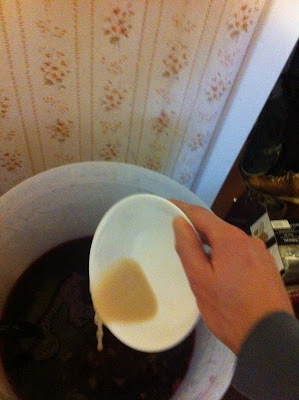 My wine turned out great. It ended up being quite dry so I added a bit more honey to taste at the end (say 1/4 cup in 3 gallons). However I needed to add potassium sorbate so that the extra honey would not ferment and cause the bottles to explode! Campden tablets are used to kill off any germs and I always use them. 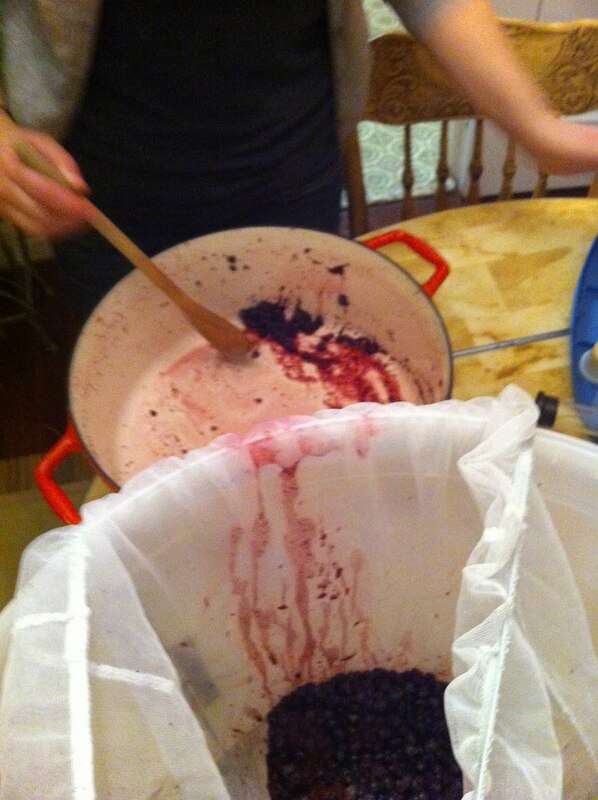 You'll have to find someone else who's making organic wine and check out their process. Also, make sure you degas the wine because otherwise, it could be fizzy or leave you feeling bloated.